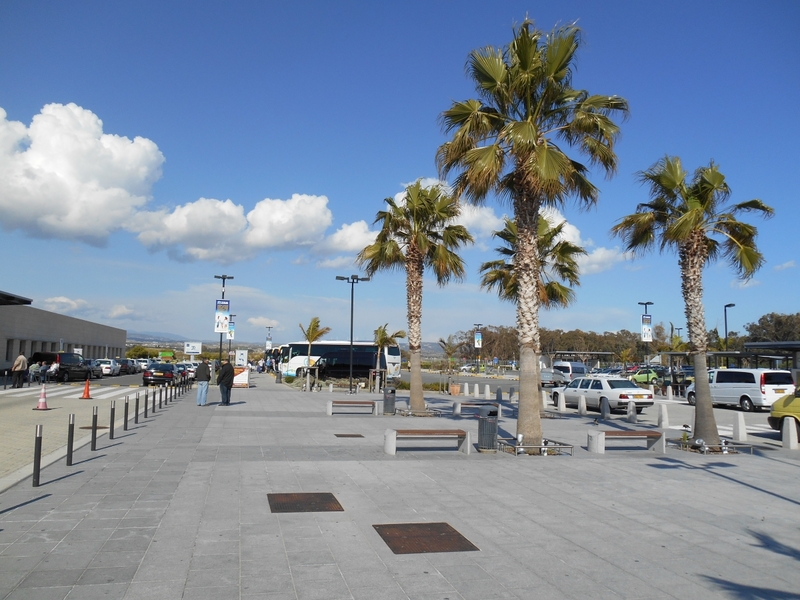 Paphos Airport or Pafos Airport (PFO), is located approximately 17klms (10 miles) outside Paphos itself and provides an ideal gateway for passengers visiting Paphos and surrounding towns and villages such as Polis, Latchi and Troodos Mountain, to name but a few. The airport also provides the perfect gateway to explore other popular attraction in Paphos and the popular resorts such as Limassol, Larnaca, Ayia Napa, Protaras and Pernera are within reach of the airport in Paphos. This website is designed to provide useful information and answer some of the frequently asked questions about the airport and Paphos itself. We hope you find the website and information beneficial for your visit and if so, please ‘Like this page and help others. The view of the Cypriot coastline as the plane takes its flight path and approach into Pafos International Airport. Paphos International airport is located on the west side of the island of Cyprus and is the second largest of the two airports in Cyprus. Pafos airport provides easy access to the resorts of Paphos and Limassol and other popular beach locations such as Coral Bay, Polis and Latchi (or Latsi as it is also known). One of the great beauties of landing at Paphos International Airport is that you are just a 20-25 minutes drive away from the centre of Paphos, which makes the transfer to and from the airport very easy and also keeps the cost of your airport transfer to a minimum. One of the great things about Cyprus, is that the island is not that big and although the popular resorts on the other side of the island such as Ayia Napa and Protaras are only 2 hours drive away. The resort of Ayia Napa is approximately 174 klms (108 miles) from the airport in Paphos and most people wishing to stay in Ayia Napa usually fly into Larnaca International Airport, which is the closest of the two airport in Cyprus to Ayia Napa. However, many people do choose to fly into Paphos rather than Larnaca International for various reasons and then make their way across the island either by public transport or car hire. The old airport terminal in Paphos was very small and very basic but served a purpose. However, due to the steady growth in tourism over the past years, Paphos International Airport has had a new terminal built. In November 2008, the new terminal at Paphos Airport was opened and although compared to many other International airports it is still relatively small, it now provides much better facilities at the airport and better services to tourists and passengers using the airport throughout the year for both Business and Leisure. The new airport terminal at Pafos International Airport can now accommodate over 2.7 million passengers per year and is operated by Hermes. You can still see the old airport terminal at Paphos which stands next to the new terminal. Getting to and from Paphos airport is relatively easy and the new road network and infrastructure that has been built around the airport now means you can access Paphos Airport via the B6 main road. The A6 motorway provides easy access and connects Paphos and Paphos Airport with other major towns and resorts on the island such as Limassol, Larnaca, Ayia Napa and Protaras. Although there is a regular bus service that operates from the International airport Paphos to the centre of Paphos, getting to destinations further afield by public transport can be a little tricky. It is possible to catch a bus to various destination on the island from the bus station in Paphos but if you are wanting to reach resorts such as Protaras and Ayia Napa, you would be better off hiring a car, paying for a taxi or using one of the shuttle bus services. There are many factors that will determine how much your transfers to and from the airport will cost you and you should try to find the best form of transport to suit your own requirements and budget. Depending on where you are staying on the island will obviously affect the cost of your transfer to and from Paphos airport as will the number of people travelling in your party. If you are travelling alone and simply wish to reach the centre of Paphos, then taking the airport bus is certainly the cheapest form of transport and will only cost you a couple of euros.However, if there are several people travelling in your party and you intend visiting a few different places during your visit to Cyprus, it is strongly recommended to consider hiring a car simply because it can work out much cheaper than paying for a each person per transfer. There are several car hire companies that operate from Paphos airport and are Budget, Europcar, Sixt and Astra & Petsas whom all offer competitive prices, especially if you book your car rental in advance. We have provided a link to some of the companies and car hire comparison search engines that offer the best deals. Obviously, you can shop around but you are certain to find a deal that suits your requirements and budget by following the link below. There are many independent companies that offer transfer services to and from Paphos airport. The prices of each transfer varies depending on distance and the amount of people in your group. We have provided a link below to help you find the best deals. If you are catching the bus from the airport to the main bus station in Kato Paphos, you may be wondering where the bus station actually is in relation to the centre of Paphos. 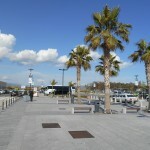 The main bus station in Paphos is situated at the far end of Apostolou Pavlou Avenue next to the harbour. The airport bus does run along the main coastal road into Paphos and if you are staying at one of the many hotels that are located along the front, you may able to get off at a stop close to your hotel, depending on which you are staying at. If you are staying close to the harbour or the centre of Kato Paphos then you may need to stay on the bus until the bus station. It is advisable to check the proximity of your hotel in Kato Paphos to see which is best for you. There are no hotels onsite or situated next to Paphos airport itself. However, due to Paphos airport being close to Paphos centre, it is not hard to find accommodation and is within easy access of Paphos itself. Taxis also operate from outside Paphos airport arrivals terminal. It is always a good idea to set a price before you get in a taxi. Paphos International has a large number of flights arriving and departing throughout the year both Scheduled and Charter flights. Many of the low budget airlines such as Ryanair, Jet2 and Easyjet now have many flights into Paphos from a number of UK airports such as Manchester, East Midlands, Luton, Gatwick, Edinburgh, Bristol and Stansted. other Tour Operators and airlines such as Thomas Cook, Thomson and Monarch also offer flights to Paphos. Baggage Wrapping – There is a Baggage Wrapping service available at the airport which is located in the entrance of the main Departure area. Wrapping your luggage helps protect it from damage and open accidentally. As you make your way from Paphos airport to your destination, you may be a little confused with the signs you see. Especially if you have hired a car and are trying to orientate your way there. Some of the signs you see will spell the towns differently, here are a couple of the more popular towns and cities and how the spelling is different. The airport currently has 24 check-In desks and each flight is allocated a certain number of desks. If you need to check-in for your flight at the airport drop off ‘Hold Luggage’, you will need to find the appropriate check-in desk that has been allocated for your flight and proceed to the desk. Please Note: The airport can become busy, especially during peak times and it is advisable to arrive at the airport at least 2 hours before your departure time. As with any International airport, there are certain Security measures in place at Paphos International airport. Any passengers wishing to fly from Paphos will need to comply with these Security measures before they are allowed to enter the main Departures area and board their flight. If you are flying from Pafos Airport and would like to know more about the airport Security procedures for Departures, you can read more on the following page: Departure Procedures At Paphos international Airport. If you are flying into Pafos Airport, you will be required to comply with the Security procedures that are in place at the airport for Arrivals. Before you are allowed entry in to Cyprus will be required to present a valid passport and any other documentation you may need (depending which country you are flying from) at Security and Passport control. There is a ‘Baggage Storage’ facility available at the airport and this is located in the check-in area. The service is available for any passengers wishing to leave their baggage for a short period of time. This service is especially handy if you are flying into Paphos for a few days and have excess luggage that you do not wish to carry around with you or if you have a connecting flight and need to store you luggage whilst you wait. There are certain stipulations regarding leaving your baggage to which you will have to adhere to if you wish to leave your luggage at the airport. If you wish to leave baggage at the airport you will need to make your way to the ‘Special Baggage’ desk or contact Galatariotis Technical Ltd who are the company that run the service. The airport offers passengers FREE WiFi access throughout the airport terminal. Cash machines are located in the main public area of the terminal building. As you exit the doors from the Baggage Reclaim area and enter the public area of the main Arrivals area, the cash machines are located to the left next to the car hire desks. Many people ask the question “is there a smoking area is Departures at Paphos Airport” and the answer is yes there is. There is a designated smoking area located outside once in the Departures lounge. Once you have cleared Security, simply walk through the Duty Free area into the Departures Lounge and turn left. You will see a café and the smoking area is located through there outside at the back. The smoking area is a sheltered terrace/patio and has tables and chairs for your comfort. If you are departing from Paphos Airport and flying back into the airport, you can take advantage of the ‘Shop and Collect’ service. The ‘Shop and Collect’ service allows you to purchase goods from the Duty Free shop at the airport and then collect it on your return. This means that you can take advantage of the Duty Free prices at the airport before you depart but not have to carry your purchases on your travels. The service is FREE to use if you are travelling within the EU. There are certainly a large number of attractions in Paphos and things to do, to keep you entertained throughout your stay. No matter what your interests may be, there is something for the whole family. Whether you just want to chill out on the many great sandy beaches in Cyprus, visit the one of many Archaeological sites around Paphos, have a day at the waterpark, a trip on the Paphos sightseeing bus or simply lounge by the pool, you won’t be disappointed. Paphos Harbour is definitely one of the main focal points in Paphos and one that offers a number of different attractions for visitors. Whether you are taking a stroll during the day or at night, the harbour in Paphos has a unique charm. Steeped in history, the old harbour castle provides a wonderful backdrop to the lively waterfront, bars, cafes and restaurants. Weddings in Cyprus are certainly a very popular choice with couples wanting to fly to Cyprus an tie the knot and there are a large number of wedding in Paphos throughout the year of . There are several different types of wedding venues in Paphos to choose from including traditional churches, town halls, Cypriot house and hotels overlooking the sea.